Illinois Battery Specialists - Fuel Economy Don't Wait Until It's Too Late!Maximize your vehicle's performance and prevent costly repairs with Aero Hybrid Power products. 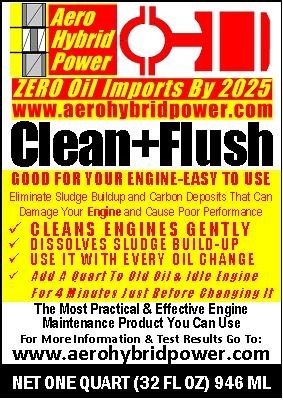 Maximize your vehicle's performance and prevent costly repairs with Aero Hybrid Power products. Doing a little bit here and a little bit there won't help. Follow our complete program of vehicle care and you'll see the difference. Waiting too long between oil changes increases the concemtration of carbon particles, sludge, acids and other contaminants that build up in your oil. The effects are cumulative with each oil change, especially if it is extended beyond a 4000 or 5000 mile change interval. Eventually, the lubricating efficiency of your oil is diminished and causes permanent engine damge and big repair bills. A clogged air filter resistricts the flow of air into the engine. When it becomes extreme, it actually acts like a brake on the engine. This casues poor fuel economy. The engine may still burn the fuel completely, but the drag on the engine, especially if it is a small engine, wastes fuel and can cause severe and expensive damage. Restricted fuel flow results in both stalling and surging engine power. Besides being a dangerous condition, it can waste a lot of fuel and you can lose control of your vehicle. At some point, the damage could cost thousands in repair bills. Avoid expensive repairs with our fuel system products. One bad spark plug on a 4 cylinder engine can cause up to 25% loss of fuel economy and cause permanent engine or catalytic converter failure costing thousands in repair expense.